A group of young gymnasts from Oldmeldrum-based ETKO Gymnastics Academy returned from a recent event in Perth with an impressive medal haul. ETKO Gymnastics Academy was one of 33 clubs who sent teams to the Women’s Artistic Floor & Vault Competition at Bells Sports Centre in Perth. 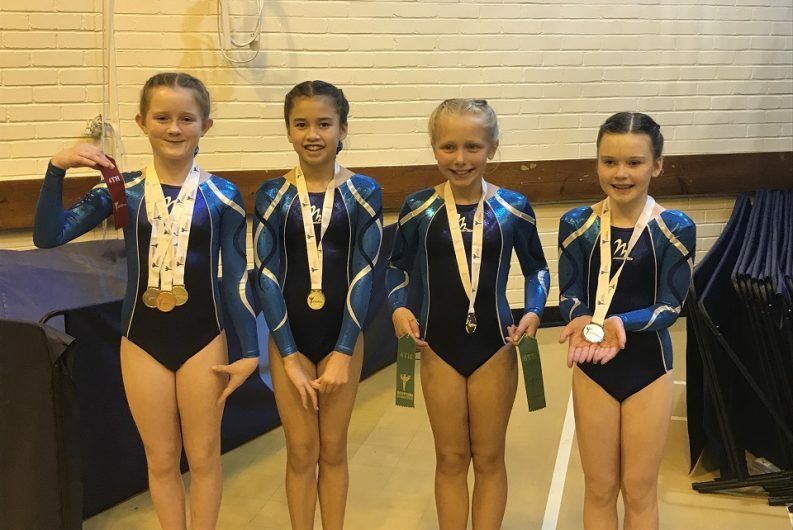 The north-east gymnasts triumphed in the 10/11 beginners’ category with the four-strong team of Madelyn Mair, Tasia Stuart, Caitlyn O’Neil and Freya Wallace claiming gold. Team representative Madelyn Mair was also awarded individual third place overall and second place on vault. There was further podium success for the ETKO gymnasts in the 9+ intermediate category. The club’s team of Lily Park, Niah McIntosh and Amy McKay won team bronze, with Lily also placing third individually on floor. A five-strong team from ETKO Gymnastics Academy competed strongly in the 12+ intermediate section, gaining a respectable sixth place. ETKO Gymnastics Academy members train within ETKO Sports Academy’s purpose-built centre in Oldmeldrum. The 1092m² centre is fully equipped with a sprung floor for practising routines, plus competition-standard apparatus. The club’s competitive programme is led by head coach and former international gymnast Laura Etko, who is also the founder and director of ETKO Sports Academy. Commenting on the girls’ performance in Perth, Laura said: “This was another excellent experience for our teams, who competed well against a large number of clubs from throughout Scotland. ETKO Sports Academy is the training home of ETKO Gymnastics Academy. The organisation offers gymnastics, wrestling and other sporting opportunities for all ages, from baby gym through to teen and adult fitness classes.